By Sean Jones: Daniel Jacobs will be at ringside this Saturday night for Saul Canelo Alvarez’s fight against Rocky Fielding at Madison Square Garden in New York. Jacobs (35-2, 29 KOs) is hoping to get the Canelo fight on May 4 on Cinco de Mayo despite the talk that former middleweight champion Gennady Golovkin may be the one that faces the Mexican star on that date. Jacobs has wanted a fight against Canelo for some time. Now that Canelo has signed a 5-year, 11-fight, $365 million deal with DAZN, it increases the chances that Jacobs will get a fight against the Mexican star at some point. It just might not be on May 4. Everything points to GGG getting the fight with Canelo on that date. Golden Boy Promotions and GGG Promotions have jointly booked the T-Mobile Arena in Las Vegas, Nevada for May 4 in 2019. That’s a huge hint that Canelo and GGG will be fighting a trilogy bout. It’s not likely that Canelo and his promoters at Golden Boy Promotions will select the 5’11” Jacobs to fight on May 4. That’s a risky fight for Canelo, and there’s not much to gain in fighting the New York native Jacobs. Last year, Jacobs lost to Golovkin by a 12 round decision. Although Jacobs has come back to win his last three fights over Luis Arias, Maciej Sulecki and Sergiy Derevyanchenko, he didn’t look good in any of the fights. Jacobs just barely edged Derevyancehnko and Sulecki in his last two fights in beating them by 12 round split decisions. 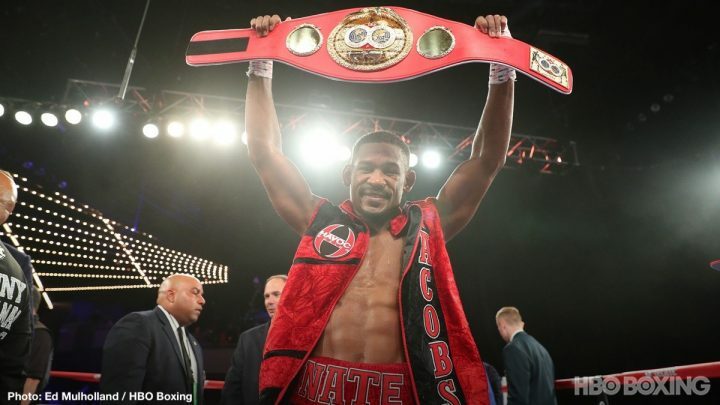 It’s still unclear whether Jacobs will be staying with Matchroom Boxing USA. Jacobs had a co-promotional deal with Matchroom promoter Eddie Hearn. Jacobs’ multi-fight deal with HBO is now up. Even if it wasn’t, it would be up now that the network is getting out of the boxing business. Jacobs, 31, recently won the vacant International Boxing Federation middleweight title on October 27 in defeating Sergiy Derevyanchenko (12-1, 10 KOs) by a 12 round split decision on HBO at Madison Square Garden in New York. The scores were 115-112, 115-112 for Jacobs, and 114-113 for Derevyanchenko. If Jacobs can get the Canelo fight, it’ll be a unification match. Jacobs will have his IBF 160 lb title on the line, and Canelo his WBA/WBC belts. Golovkin’s promoter Tom Loeffler says he doesn’t have anything to prove in fighting Canelo a third time, as he beat him twice already. GGG doesn’t have anything to prove against Canelo. He beat him twice,” Loeffler said to Fighthub. Loeffler might not see the importance of Canelo and GGG fight each other in a trilogy fight, but the boxing world sees it as crucial that they fight again. The third Canelo-GGG fight will show who the better guy is, as long as there isn’t another controversial decision. Golovkin going back to Las Vegas for a third fight with Canelo could be a problem if the judging is similar to the first two fights between them. Ideally, it would be good for the Canelo vs. GGG trilogy fight to take place in a different state the first two matches so that boxing fans can’t continue to say that the only reason Alvarez is dodging losses is due to him being so important for the city of Las Vegas. Canelo’s contract with DAZN is a huge one worth potentially $365 million if he finishes the entire 5 years. It’ll be interesting to hear what kind of contract GGG receives from DAZN, if the figures are announced. Rocky Fielding could spoil everything by beating Canelo this Saturday. A win for Fielding over Canelo will make it tough on the Mexican fighter to walk away from the defeat to face GGG or Jacobs on May 4. Canelo would need to face Fielding in a rematch for him to avenge the loss. There’s certain types of defeats that a fighter like Canelo could absorb without it hurting his career. For instance, Canelo’s defeat at the hands of Floyd Mayweather Jr. didn’t hurt his career in 2013, but that was because of the talent of Floyd. But losing to Fielding would hurt Canelo’s career in a major way. Fielding is not viewed as having a ton of talent. He’s a good fighter with size and power, but he’s not viewed as being the most talented guy in the 168 lb division today.